I find books like this one that have themes related to humans with supernatural abilities very interesting. I feel that I have read several books recently where the lead characters has some supernatural ability and then they have to run from the bad guys who are trying to capture them to test their genes and make a superhuman race. Samantha is on a trip with her friends when she turns invisible. Nobody notices that occurrence but after a few seconds, people believe that she’s fallen overboard as they cannot find her. However, her good friend Will realizes that Sam is a rippler. 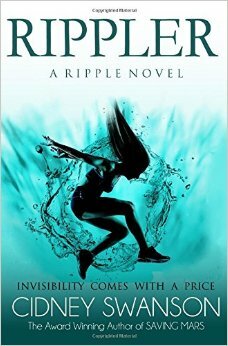 He later tells her that she was “rippling”, a term used to describe becoming invisible. He says that the ability to ripple is a side effect of a medical condition and that this ability is very, very rare. Will later tells Sam that he and his sister were working with a professor that investigated this condition but they had to go into hiding when the professor was murdered. Since then, Will and his sister have been investigating the mysterious deaths of the people who studied rippling. Sam later finds out that Will can ripple too and she is overjoyed at having someone to share her experiences with. Will trains her in the art of rippling and also learns about her in the process. However, Sam’s ability to ripple creates some unexplained events that lead to her losing all of her other friends as she can’t tell any of them about her abilities. Moreover, she finds out that her mother’s death was not an accident and that the people who killed her mother are out to get her as well to learn about her genetic makeup and to try and create a superhuman race of invisible people. Will Sam and Will be able to evade the people out to get them?